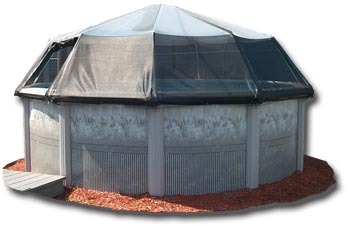 What are the benefits of having a Sun Dome on my pool? Is there a Sun Dome to fit my pool? 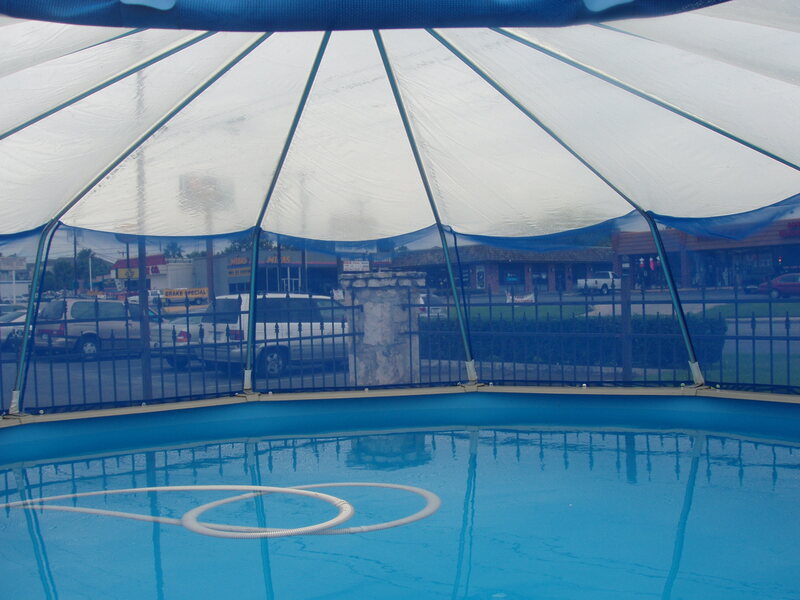 We can fit almost any round or oval above-ground pool. 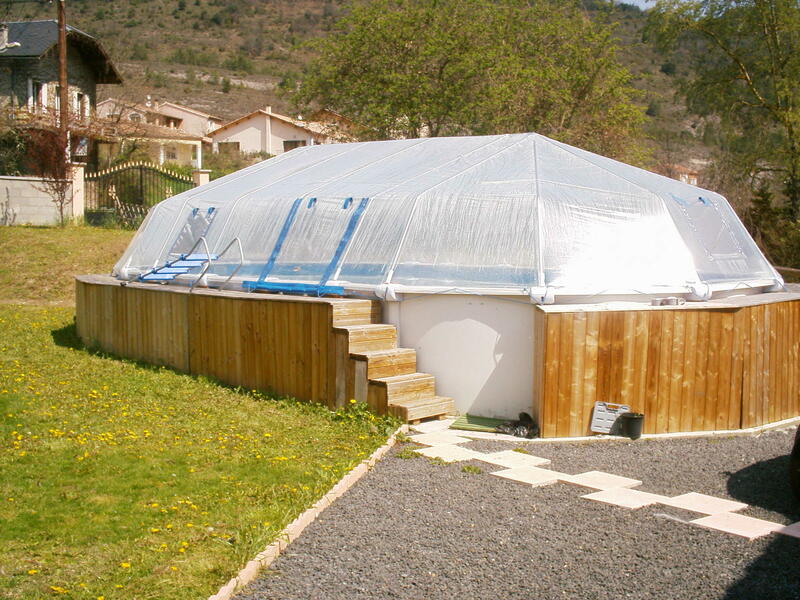 Sun Domes for in-ground pools are rectangle in shape. 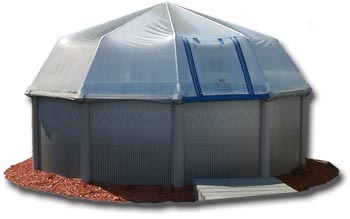 Please check out our Sun Dome Product Page to help you find the right Sun Dome for your pool. What is the Sun Dome made of? The cover material is 12-mil double polished clear vinyl. The frame is 1″ diameter polished aluminum tubes. Neoprene shock chords attach to grommets to secure the enclosure over your pool. Can I install a Sun Dome myself? Most of our customers do install the Sun Dome easily at home. Generally, it takes 2 – 3 hours, assuming you have a power drill, measuring tape and duct tape. 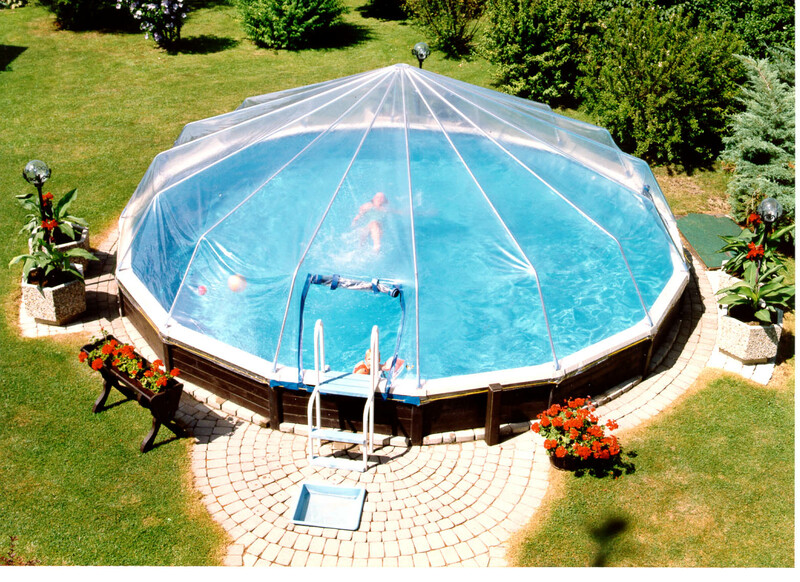 In-ground pool domes however require more installation – generally for this product you should assume it would take two men, 8 hours. Do you have someone to install it for me? Some dealers or retailers will provide installation. If not, we suggest contacting a local handyman. What about winter weather conditions? The Sun Domes will usually take winds up to 40-45 mph, however, it is not made to withstand heavy sustained winds, and more important, the weight of snow. In heavy snowfall areas, it is necessary to remove the dome before the first snowfall, on a sunny day. How do I clean my Sun Dome? We suggest cleaning the Sun Dome with mild soap and water – dish or car wash soap work best. Test a small patch first to ensure the product you select works properly. Please note: do not use any oil-based products, as it will damage the vinyl. There are no cleaning requirements, however if there is lots of debris on your Sun Dome we suggest you clean it before storing. What if my Sun Dome gets punctured or damaged? We supply a patch with every Sun Dome when it is sent to you. However, if you need additional patch vinyl material, please contact us directly. How do you take down a Sun Dome and how do you store it? In order to take down the Sun Dome, simply unsnap the neoprene cords all the way around the pool and gently tug the cover up and over the frame. Make sure the cover is clean and dry prior to folding it for storage. It can be rolled up, similar to a sleeping bag and should be stored in a cool dry place when not in use. Also, cornstarch can be sprinkled between the folds of the vinyl to keep it from sticking together. 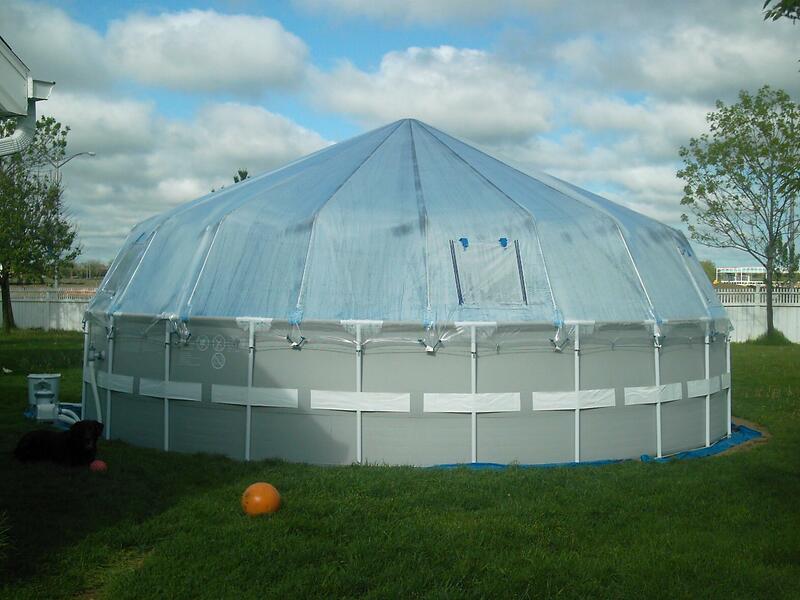 If a dome cover is wet prior to storing it may turn milky white. However, this condition will clear up once the cover is back on the frame and exposed to sunlight. Does my Sun Dome protect me from harmful UV Rays? 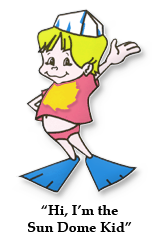 While it is not intended for sun-protection, …..It will keep UV Rays out. You can get a slight tan with the dome on, but you will not get a sun burn. How do I order replacement parts if I need them? Please contact your dealer or us if you need any replacement parts.